Called the company’s Customer Support team. I looked at the company’s logo and thought: “Not for nothing it features the heavily accentuated letter A. If I buy a paper here, I would probably get an A.” Boy, was I wrong! 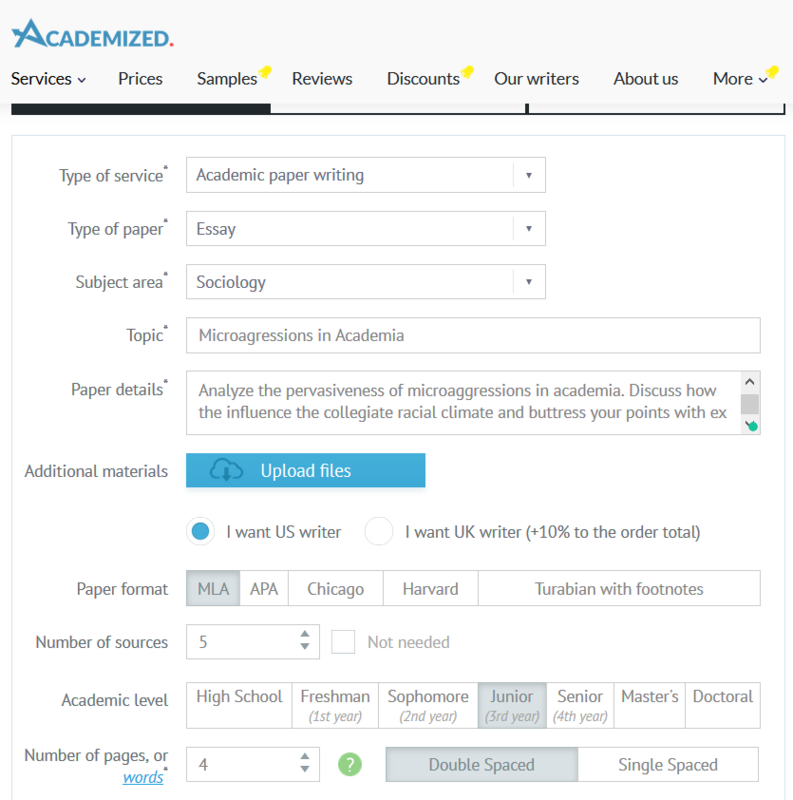 If you have enough disposable income, Academize is there to help. And by enough I mean A BOATLOAD. The agency is well aware of the fact that a rare student can afford to spend a hundred bucks on a research paper. For this reason, the company tries to gain customers’ interest by dangling a discount code before them. Pro-tip: use the code or find a promo coupon on the Web. Otherwise, you will end up spending too much and try to get a refund, which is not something Academized gives away willingly. Now, let’s take a closer look at the company’s prices. The cheapest, if the word “cheapest” is even applicable in this case, is the school-level writing. A page with a reasonably long deadline – 10 days – costs $15.99. If you are in a hurry, prepare to fork out $41.99 per page. Let’s say you need a 4-page essay. It would cost you $168. You could get an essay tattooed on your back for that money! Writing at the master’s level with a 10 days’ deadline costs $23.99 per page. The same writing finished in 8 hours costs $45.99 per page. I was shaken by the agency’s prices. Luckily, my academic predicament wasn’t characterized by urgency, which is why I was able to order an essay without going broke. However, the dent in my budget was painfully noticeable – $83.96. This paper is written to throw the lights on the problematic issue of microagression. The issue is real problem in today’s America. It also influence students in college especially those of color. Racial microagressions while commonplace in college is often remain unnoticeable by perpetrators who hurt people and minorities. No one is being immuned from being hurt with biases and prejudices, which shows importance of raising awareness about the problem. I want to draw attention to the issue of microagressions in college in this essay and stop racism from being spreaded casually on campuses in America. The essay was loopy, which was a pity considering the gravity of the issue and the amount of money I paid for it. Reading the paper felt like crashing a boring party in which the only courses were clichés and grammatical errors. Naturally, I was infuriated. Now, plagiarism. I used free plagiarism detection software to discover that almost 8% of the essay was stolen. And you know what? The notorious instances of plagiarism were self-evident because perfect sentences looked out of place in the shoddy essay. We are living in an era of unrestrained capitalism and the Wild West Web. When legit business practices and social norms are scarcely enforced online, myriad cheating companies step into the breach. Scam becomes rampant; trustworthy companies are pushed to the periphery. If you ask me, Academized is the same company as Boom Essay. Namely, it seeks to capitalize on the lack of regulation creating hundreds of dissatisfied customers in the process. Academized.com safe bet is to forsake its underhanded operational practices to stay in business. If nothing changes, the company is doomed. As for now, the agency’s operating principle seems to be “make hay while the sun shines.” It lures customers who don’t know any better with expensive ads and sells them substandard essays. When the jig is up, Academized will probably concoct another dubious scheme. Should you trust Academized.com? Hell, no! When I called the company’s support team and asked how to communicate with writer in Academized, a rep informed me that I should use my email as login to sign in to my account to write them a message. She also told me that I could send my missive in .pdf, .doc. or several other allowed upload formats. I didn’t want any of those. The only thing I wanted was to hold a conversation with the pathetic essay’s author. The rep said that it wasn’t possible and helped me to lodge a complaint. It took Academized two weeks to refund my money. I was pissed. I did not submit the essay purchased at Academized. It was perfectly suitable for mining some fodder for grammar Nazi’s nightmares but wasn’t good enough for submission. Therefore, I had to write an essay myself. Unless you want to rewrite the purchased paper at the eleventh hour, don’t use the company. I am thoroughly displeased with the writing service rendered by Academized, which is why its rating is only 2 out of 5.